With each passing day, insightCuba continues to eagerly anticipate the arrival of our People-to-People Travel License from the U.S. Treasury Department. Until the big day arrives, we thought it would be a great idea to resume writing about Cuba, today’s topic: the Malecón. First, we'll set the right tone by listening to these musicians and checking out the scenery. 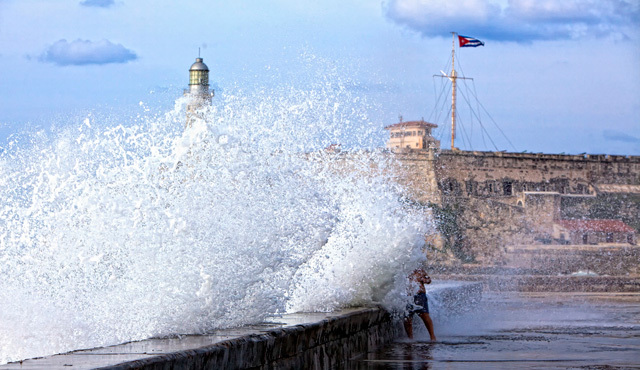 The Malecón is a cherished seaside promenade meandering four miles along Havana’s Colonial and historic center. Most people visiting Cuba prefer coming here shortly before twilight, when the magical sunsets over the Bay of Havana shine onto pastel-colored buildings. The sunsets here are brilliant, but last for only a brief moment in time. 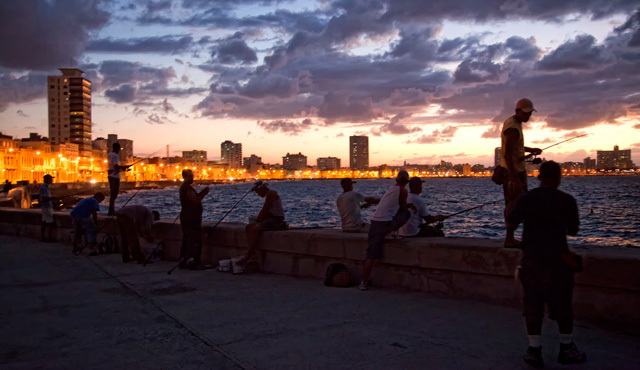 Fortunately, day or night the Malecón is a theater showcasing a delightful cast of residents from all walks of life, and perhaps no other location provides better insight into life in Havana. When the weather is agreeable, fishermen congregate along the sea wall to cast their lines or toss a net amongst the coral outcroppings. While waiting for dinner, a few relaxing hours of small talk and gazing at distant ships in the harbor ensues. Some of the elderly men appear to have been meeting here for decades, almost as if they were living personifications of Hemingway’s The Old Man and the Sea. In the winter and on stormy days, the sea crashes thunderously over the wall. Children feel like they are in a grand adventure fighting the forces of nature and bravely stand their ground against the powerful waves. Meanwhile, Santería practitioners draw inspiration from the scenery and throw offerings into the sea to placate their Yoruba gods. Throughout the day children swim joyfully or play amid the rocks. Food vendors pace up and down the esplanade selling plastic flowers or peanuts. Cheerful families delight in coming here to take long walks together, while friends of all ages share smiles, laughter and stories in the cool sea breezes. 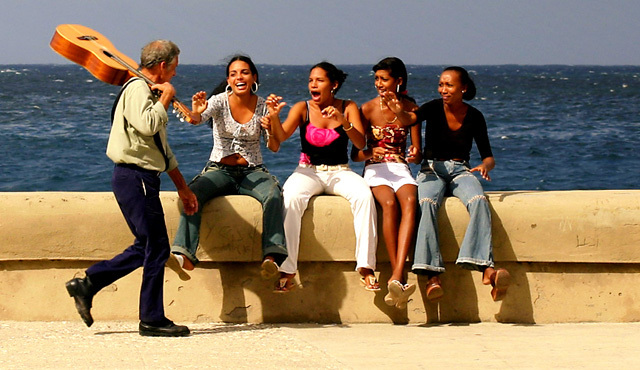 Cuban musicians visit the Malecón to express the spirit of its city. Often a single person carrying a guitar will sit on the wall to strum a few notes before the evening concert is in full swing. Couples cuddle and speak of love, while endless flirting might await women who walk by a group of fun-loving guys. With picturesque sunsets, clouds flowing gently across the bay, and the infectious sound of music, it’s easy to see why romance is always in the air. 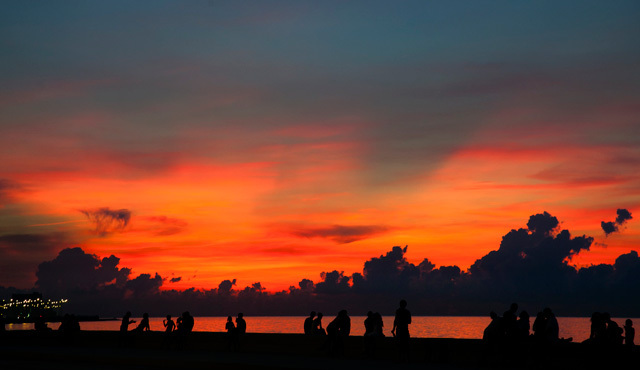 When you are in Havana, the Malecón is the perfect place to experience the essence of Cuba and the passion of its people. Initially, you may only intend to view the sunset and move on, however, don’t be surprised if you are inspired to stay well into the night.